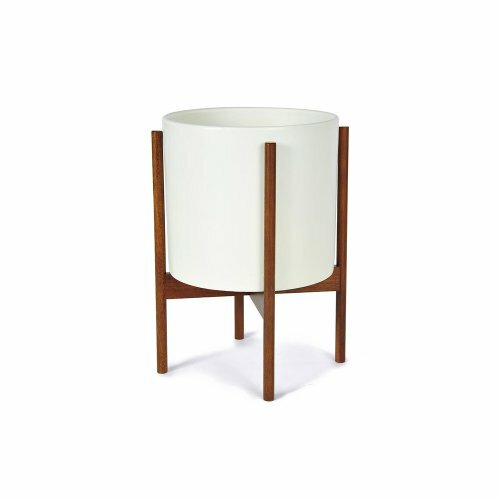 The Case Study Ceramic Cylinder Planter was originally designed during the post-WW2 architecture and design period. The ceramic planter is defined by its basic geometric shapea cylinderand its simple, clean finish. The Case Study Ceramic Cylinder is designed to be used in both indoor and outdoor spaces, and is supported by a Brazilian walnut stand. Although this planter was originally conceived over sixty years ago, it retains a contemporary, current look. In addition to its function as a planter, the ceramic cylinder can be used as an attractive storage container for indoor items like blankets and throw pillows. Small: Overall Pot on Stand: 17 7/8 H X 13 1/8Pot: 10 H X 11 ½ Dia. Large: Overall:19 7/8 H X 15 1/8 W Pot: 12 H X 13 1/8 Dia.